I drove the Westpark Tollway this morning for the first time in a couple weeks, and immediately noticed that all the guide signs are now standard green. Apparently this happened the weekend of September 30 during a long closure over the weekend. 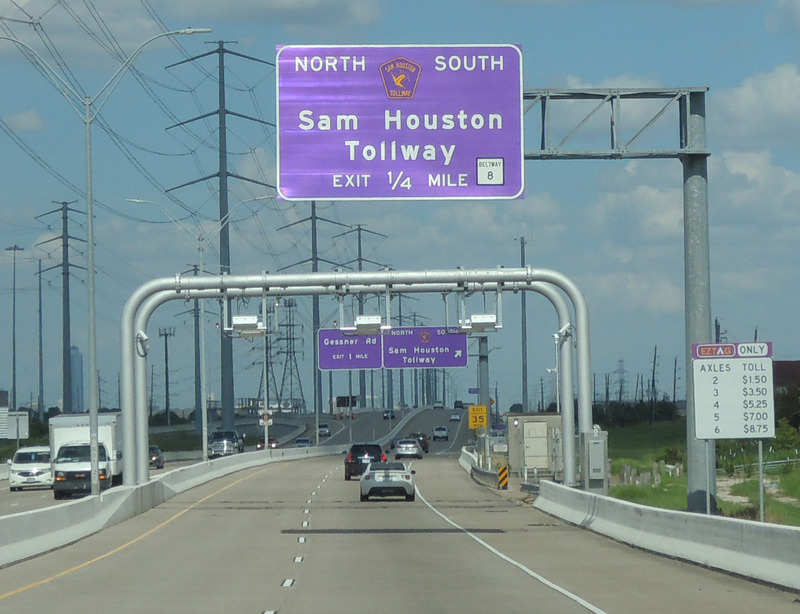 For those not familiar, the Harris County section of the toll road (opened in 2004) used purple-background guide signs when originally built, and I think all signs remained purple until the replacement event. I don't know for a fact that all purple signs are removed since I drove only the section inside Beltway 8 today. In commemoration of this 13-year run of purple signs, below is a photo taken in August of this year. Wasn't purple signage, at the time, proposed for toll routes overall? I vaguely remember something along those lines. HCTRA wanted all-purple guide signs for ETC-only toll roads and tried unsuccessfully to get FHWA permission to use them as an experiment in 2003. HCTRA installed purple signs anyway on several toll roads. I suspect they went ahead with sign fabrication under the assumption, subsequently proven incorrect, that FHWA approval would be a formality. HCTRA has been doing guide sign replacement contracts on a number of tollways, including the Sam Houston Tollway and the Westpark Tollway, so the purple signs are on their way out. That's too bad... was really looking forward to seeing those on my visit to Houston. It's likely the FHWA told the HCTRA to get rid of the purple colored signs eventually. Chances are the FHWA told them the purple signs had to go, but only once they outlived their useful life span. The FHWA probably gave this order years ago, maybe even last decade. Come time for replacement the backgrounds had to go back to standard green. And now that is finally happening. The diamond grade vinyl sheeting used on these sign backgrounds has only so long a life span. If they were installed in 2004 and replaced nearly 14 years later that's actually a hell of a good run. Normally any kind of diamond-grade retro-reflective vinyl will have maybe a 7 to 10 year life span before looking significantly faded, weathered, oxidized, etc. Basic "engineer's grade" reflective vinyl (the kind most "fast signs" shops sell for little jobs) gives only 2-5 years at best before starting to fade, crack and peel. I believe engineer-grade sheeting no longer meets MUTCD minimum reflectivity requirements and thus cannot be used on road signs. ODOT used the stuff extensively. I have an I-35 shield that was made of Avery engineer-grade sheeting. There is a pretty big price difference between the short life span "engineer's grade" reflective vinyl and the diamond grade stuff. The diamond grade stuff is pretty expensive. The cost runs multiples higher than basic reflective vinyl. This is why most sign companies rarely ever use the stuff on signs for businesses, opting for the cheaper basic reflective vinyl instead. They'll only use the diamond grade vinyl when a job specifically demands it. Since highway sign shops buy such large square footage amounts they may get a bit of a price break on the volume order.